Welcome to Safety Observation Track! Safety Observation Track is designed to assist organizations in building and managing their job safety analyses and performing safety observations in order to build an effective behavior-based safety (BBS) program. This section will help guide you through the steps and best practices to set up and begin using the Safety Observation Track application. If you have any questions or need any assistance, please feel free to contact us using the options to the right. Safety Observation Track works in conjunction with BBS Track. You can perform safety observations in Safety Observation Track based on the JHAs you have created in BBS Track. This help article will walk you through the steps to create a JHA in BBS Track. You can record a safety observation online or print out a safety observation form for a job to complete offline using the steps in this article. 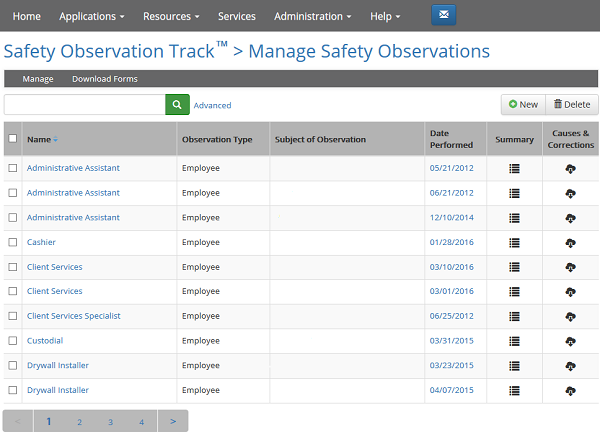 A Summary and Causes & Corrections report can be downloaded for each completed safety observation from the Manage page in Safety Observation Track.